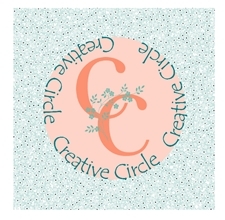 It's time for another Blog Hop by the Creative Circle Design Team! 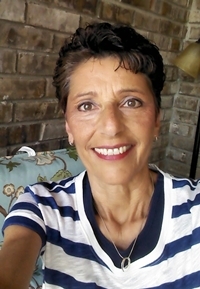 If you've arrived here after visiting Fran's blog, you are in the right place. 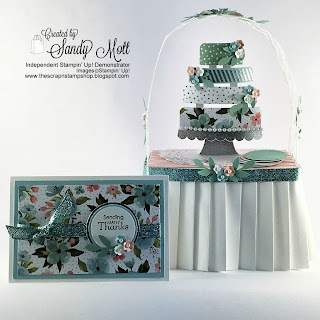 We are very excited about this hop using the Lattice Card box that we are teaching in Salt Lake City in April. We wanted to show you (ahead of time) some different ways you can decorate this box. Bridal showers and weddings are being planned this time of year and my project aims to please. I turned the card box into a cake table by cutting an extra box bottom and laying it on top. The pictures will explain this better. The box also holds a stack of thank you cards for the bride-to-be. 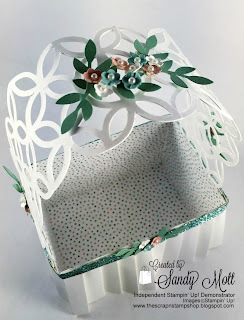 The box can serve as a cute bridal shower gift or be used as a centerpiece on the cake/dessert table. 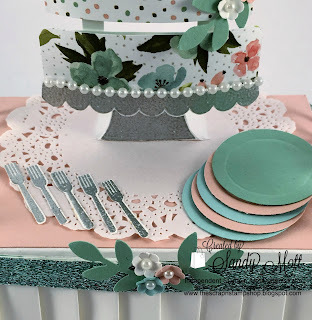 I cut the plates with the 1 1/4" circle punch. I placed a one inch circle on top of each plate and went around the one inch circle with a stylus to make it slightly rounded. 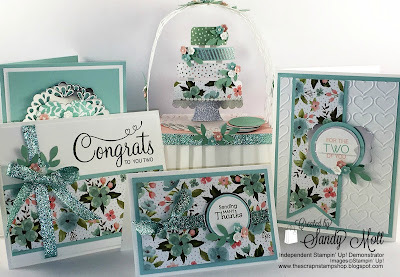 The little forks (from the stamp set "All About Sugar") were embossed with silver embossing powder and then fussy-cut. We are talking tiny little forks. The cake is "tiered" and decorated with pearls and flowers. 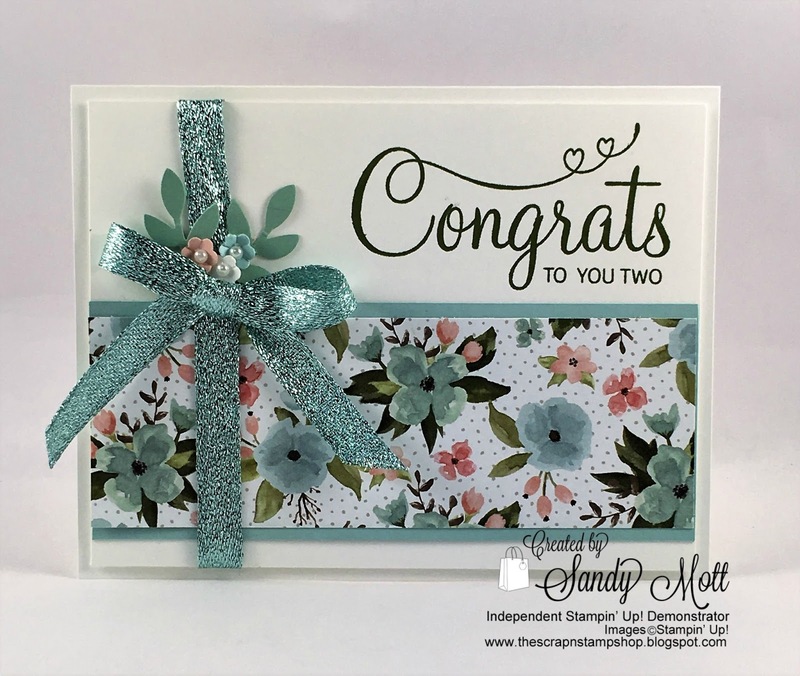 I used the "Birthday Bouquet" Designer Series paper throughout. 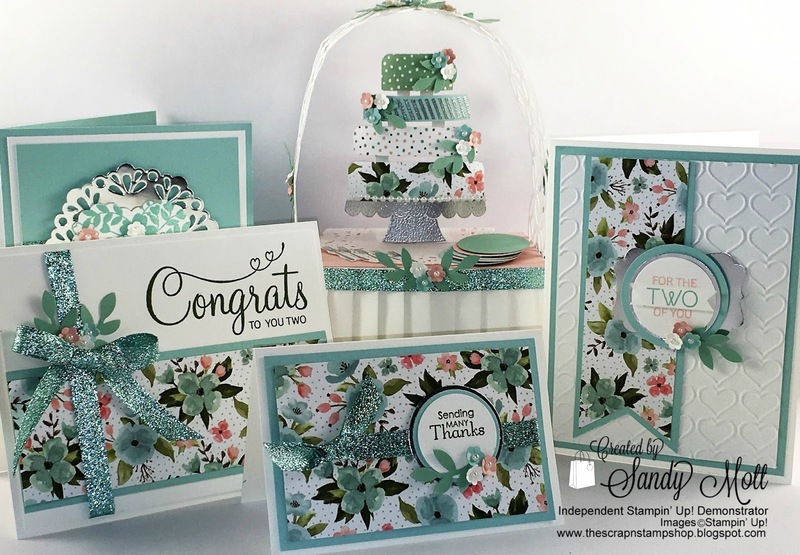 Colors of card stock and inks are Whisper White, Blushing Bride, and Pool Party. The little flowers were punched from the Tree Builder punch and the leaves from the Bird Builder punch. The picture on the left shows the table top off the box. You could adhere one flap to the back of the box. I purposely didn't do that as it is so much easier to photograph the inside without the top. You could also fill the box with a gift or treats instead of the thank you cards. The picture on the right shows the top of the lattice and the inside designer paper liner. 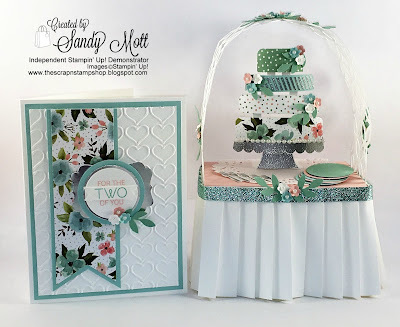 The same flowers and leaves decorate each side of the lattice. I used the Whisper White Envelope Paper to make the pleated skirt as it is slightly thinner and more pliable than card stock. And since I am totally in love with the Pool Party Glitter Ribbon, I used it to trim the table skirt. This is one of the thank you cards inside the box. It measures 3" x 4 1/2" and are easy to put together. The box holds A LOT of thank you cards as it is 3" deep. In case you're wondering how I got the tiny flowers to curve (or cup), here's a picture. Place your punched flowers on the Stampin Pierce Mat. Then take the smaller end of your stylus (I use the one that came with my Simply Scored scoring tool) and press down in the middle of the flower. As you can see, the flower "cups" and each little scallop bends to form a more realistic looking flower. You can also do this with slightly larger flowers using the larger end of your stylus. I placed a little pearl in the center of the flower and used mini glue-dots to secure it to my project. I hope you enjoyed my March design team project. I would love to hear from you! There's still time to register for "Make The Rounds" in Salt Lake City on April 13, or get your "To Go" kit. Register HERE. I was frantic looking for little silverware and that set was perfect. Thanks so much Mary! Ok, that's simply gorgeous! 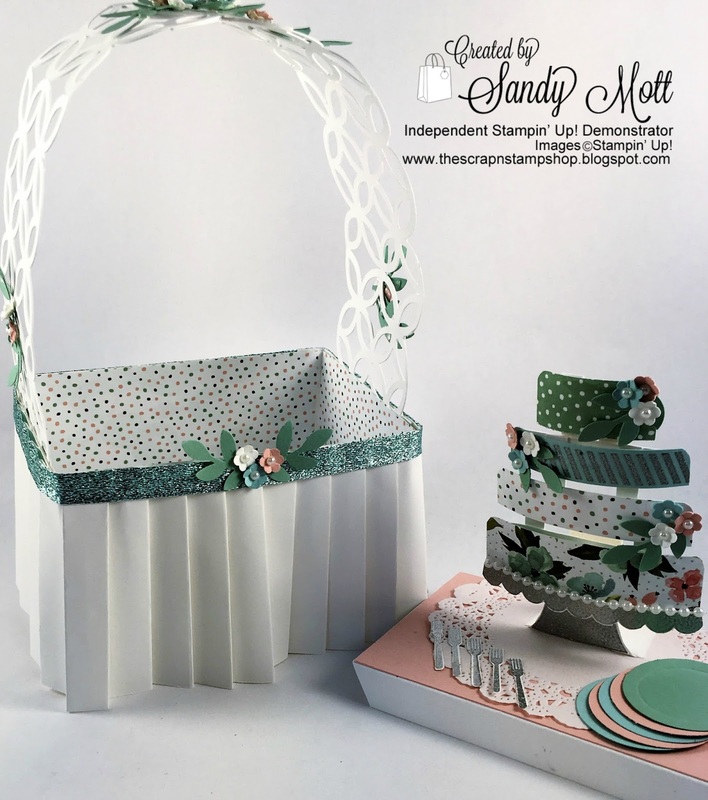 Great project, as always, Sandy! Outstanding! I would not have thought about a table for the box! 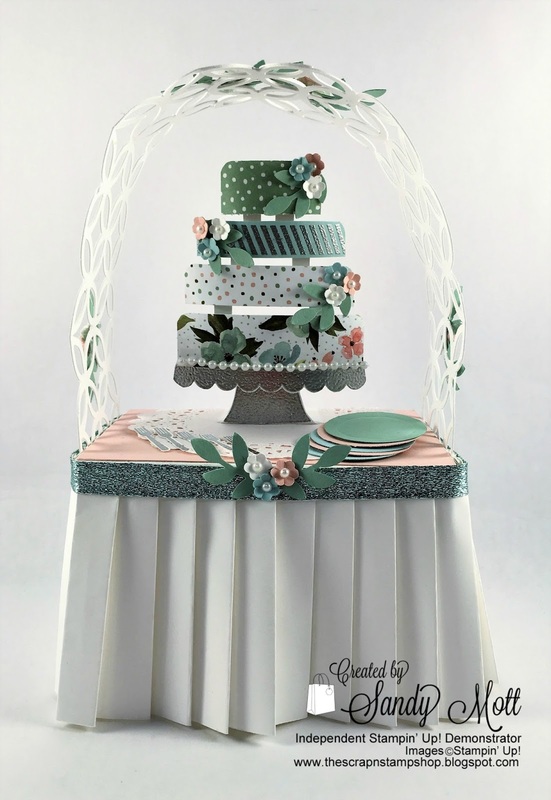 love how you used the trellis over the cake! I so appreciate you commenting! Thank you! Very lovely! 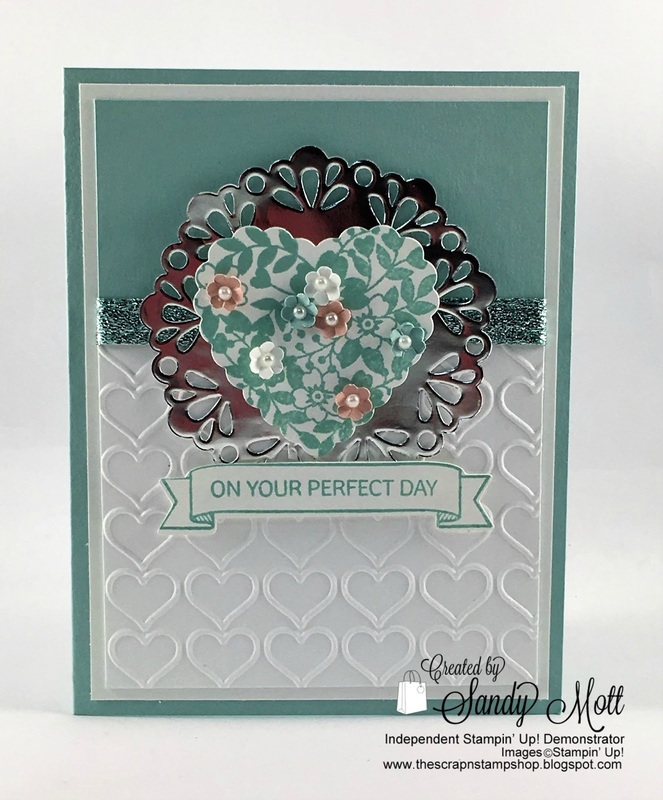 I'm dying to know how you made the lattice? Thank you Sandra L! 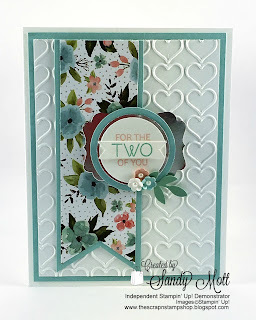 The lattice is a silhouette cut file designed by Liz Holloway. 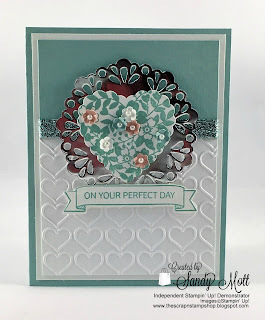 It may be available to purchase after a class we're teaching at the Stampin' Up! Onstage event in Salt Lake City in mid April. Check back here then, ok? Creative DIY ideas! 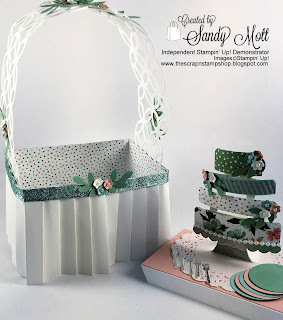 I really admire your efforts in making these creative decoration items! I have seen such things at many wedding venues and they look super cool. Thanks for the inspiration and this great share with all of us.